If it’s for diving, we can fix it. 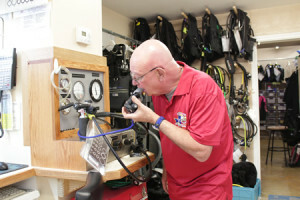 GMD Service Technicians have years of experience servicing life support equipment. 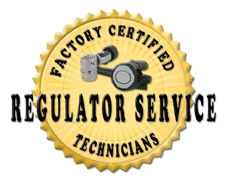 Our technicians are factory trained and hold OEM factory service certifications. 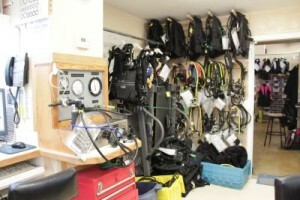 We service virtually every brand of scuba equipment. Come see our state of the art repair facility. Check out our EANx & TRIMIX fill system. How often should my gear be serviced? Most manufactures require annual service to maintain your warranty. 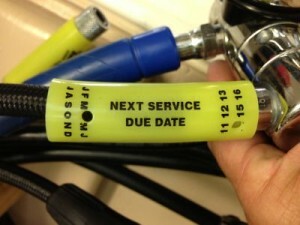 Once you are in our database you will receive a friendly reminder when it is time for your Regulator, Computer, and BCD to be serviced. This insures that your gear is safe and ready for your diving pleasure. Whereas we stock literally thousands of repair parts and manufacturer parts kits it is impossible to stock every part, for every model, ever made, so please get your gear to us well before your next dive adventure to insure that it will be ready for you in time. 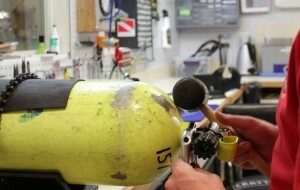 Enriched Air Scuba equipment has a very specific and detailed set of guidelines that are required. Please inquire if you are interested in this procedure for your NITROX O2 Compatible or O2 Clean equipment as Gigglin’ Marlin Divers has the only locally available “OSHA specific” oxygen clean room available for these type services. Remove and inspect conical filter, Check and 1st stage intermediate pressure, Check both 2nd stage cracking pressures. 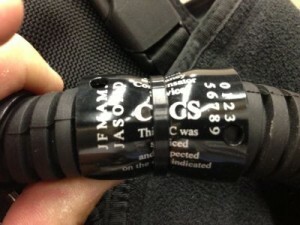 Inspect mouthpieces, Clean 2nd stage housing. * If tests dictate an annual service will be recommended. Thoroughly remove, clean & inspect all moving parts, dump valves, seats, seals & springs. Complete cleaning of inflator, airway, dump & overpressure valve components according to manufacturer recommendations. Thorough inspection of all components looking for cracks, wear & defects including BCD Body, straps & buckles. Replacement of all warranty parts (which may include filters, seats & dynamic O-rings) and worn or defective components per manufacturer recommendations. Rebuild inflator valve, & inspect Schrader valve. Adjust and leak test bladder. Our Cylinder Inspection Technicians hold current PSI certifications, and have been trained to recognize the need for cylinder neck “Eddy Current” testing. V.I.P. Doubles (Includes Air Fills)- Disassembling/reassembling will save you $. Instrument inspection for cracks or other defects. Pressured air cleaning of debris & sand from components. Replacement of Battery(s) and lubricated gaskets. Gigglin’ Marlin Dive & Swim is a Suunto Level 1 Service Center. *Everything is based on the availability of Parts & Service Kits. Prices are labor plus parts. Parts Kits typically range between $10–$29/stage. Our Platinum Club Members enjoy deep discounts on their equipment services & rentals.